While I’m on the broccoli rant I just want to say that this is one of my most favorite side dishes ever. I discovered it a long time ago in the Italian Restaurants on Long Island which are very popular for this sort of thing. I am pretty sure this recipe started out quite by accident but it caught on and is super popular back east, we even put it on our pizza! Once we started spending so much time out in Colorado I was missing my native food so just started to make it myself. All you need is some broccoli, salt and pepper, olive and oil, a very hot oven, and yeah a smoke detector that doesn’t keep going off. This is really delicious and sort of fool-proof. I served it alongside my spatchcocked chicken. Super yummy. Olive Oil – you’ll want to start out with app. 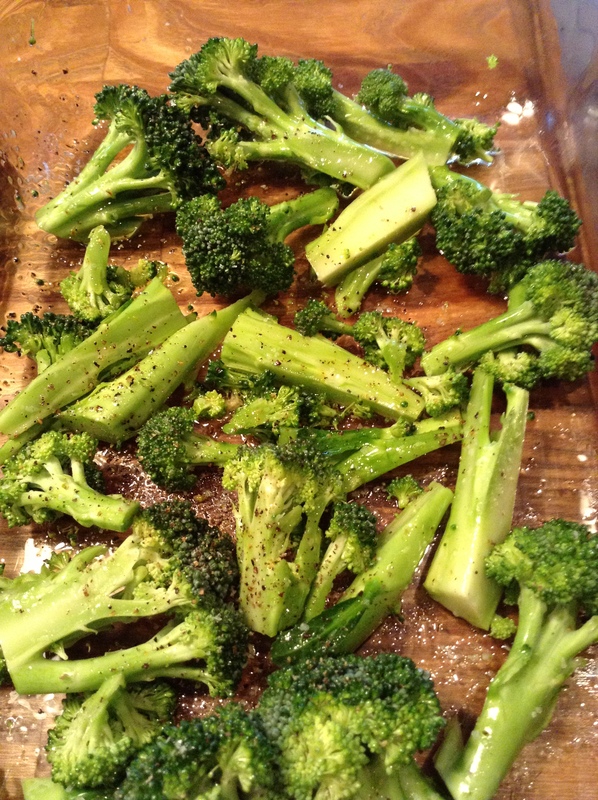 2 tablespoons of olive oil, I like to use my hands and make sure that the broccoli is covered enough. If not enough oil it will just dry out and burn out. On the other hand don’t let it swim in oil. I spray a cookie sheet with Pam cooking spray, cut up broccoli into smallish pieces ( see photo) cut off any very thick ends. Pour some olive oil* over the broccoli and with clean hands get oil over the broccoli, sprinkle well with salt and pepper. Put tray in oven for at least 40 minutes, then turn oven up to 500 and keep broccoli in for another 10 minutes. 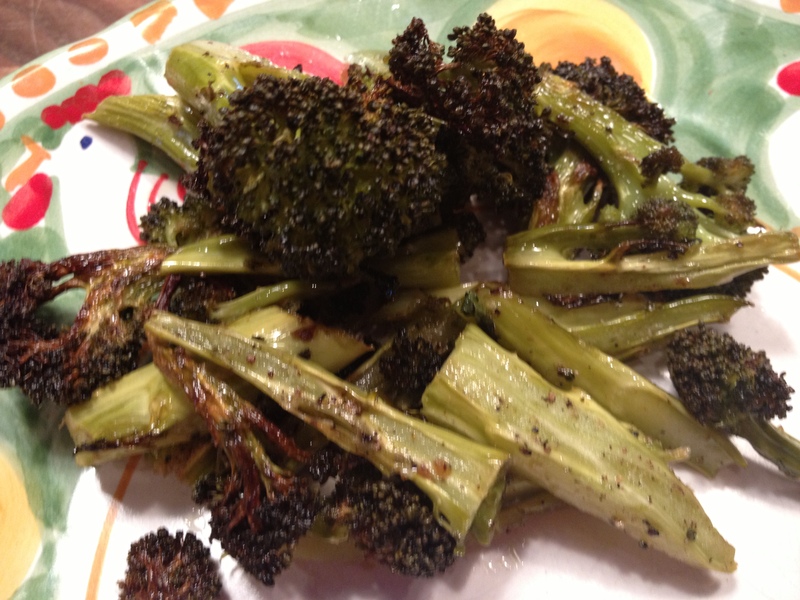 Everyone likes varying degrees of burnt broccoli , if you’ve never had it you’ll have to figure it out for yourself. This is very yummy. *Don’t overdo the olive oil, just make sure that there is oil all over the broccoli, not swimming in it. That being said, you’ll need enough to crisp it up and for flavor, so don’t skimp on it either. 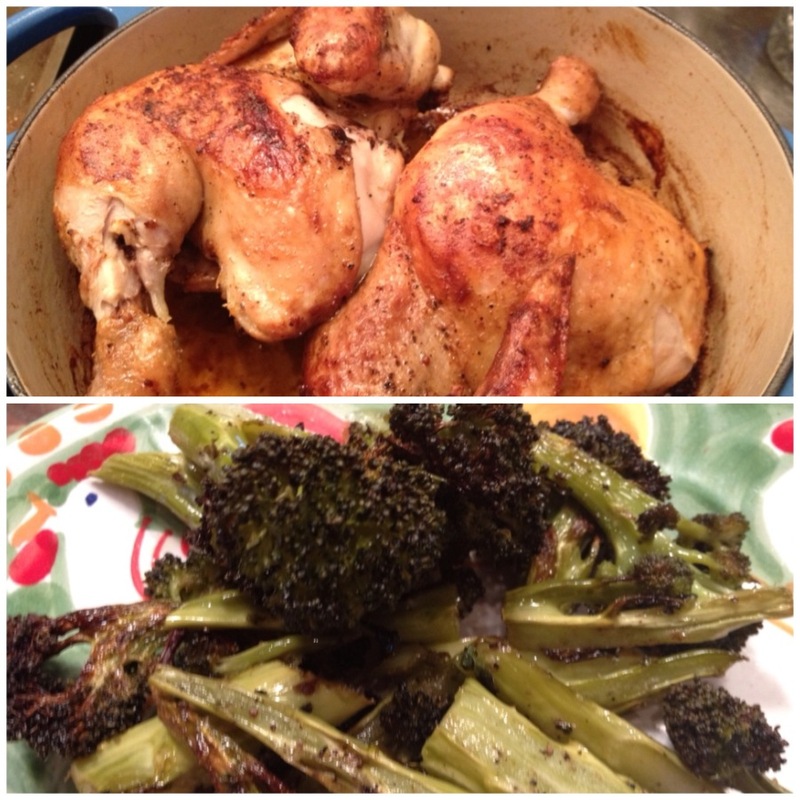 This entry was posted in vegan, vegetables, vegetarian and tagged burnt broccoli. Bookmark the permalink. I’m so happy with this recipe I know its easy but I never got it Right I also loved the shrimp And orzo How much oil? just make sure that all broccoli gets some on it, using your hands. Not swimming in it , if I had to estimate I’d say 1 – 2 tablespoons of olive oil. You’ll be able to get the feel for it, if not enough oil it will be dried out, if too much oil it will be mushy and oily. I also adore this dish. I’ve done asparagus too.